Take Current Affairs quiz February 9, 2019 to enhance your General Awareness. Practice with our esteemed Current Affairs quiz February 9, 2019 questions which covers all important events across India as well as World. Make use of all important Current Affairs quiz February 9, 2019 questions with answers updated here, at free of cost to succeed in all competitive Exams and Interviews. What is the national aquatic animal of Thailand? The Siamese fighting fish was named Thailand's national aquatic animal. In which of the following airport was the solar plant generating 3.5 MW of power was inaugurated? Where is Kempegowda International Airport (KIA) located? Kempegowda International Airport (KIA) is located at Bengaluru, Karnataka. What does USFDA stand for? USFDA stand for United States Food and Drug Administration. India first smart city site visited by the Chinese solemn monitoring the development amidst. Which country ropes in space technology to track border management? India ropes in space technology to track border management. ------- chooses the Go Green option; inaugurates 2MW solar power plant in military station? Indian Army chooses the Go Green option; inaugurates 2MW solar power plant in military station. Which country dropped out of 100 and Belgium remains at the top? India dropped out of 100 and Belgium remains at the top. Ranji Trophy Vidarbha claimed Second Successive Ranji Title beating Saurashtra. France highest civilian honour is conferred to 92 years Old Bengal Priest Father Francois Laborde. Which Police Commissioner launches mobile app Digicop ? Chennai Police Commissioner launches mobile app Digicop. Are you looking for right place to enhance your Knowledge on Current Affairs of 9th February 2019 through effective Quiz section? FreshersLive grants you the advantageous Current Affairs Quiz questions with accurate answers for 9th February 2019 which covers all the important events, supreme Awards, major occurrences in the National as well as World level. All important Current Affairs Quiz questions of 9th February 2019 are updated instantly in this page. Everyday at least 25+ Current Affairs Quiz Questions are displayed in this FreshersLive page. Correct Answer for each quiz question is given at the end of the entire 9th February 2019 Current Affairs Quiz questions section. You can estimate and upgrade your GK by attending these useful quiz questions. 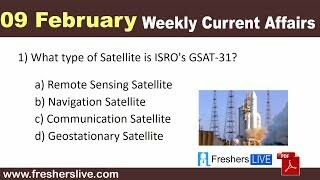 Entire quiz questions of 9th February 2019 Current Affairs covers Competitive Exam as well as Interview point of essentially important topics like International News, National News (ie. Indian Affairs), Science & Technology News, Environmental News, Bills & Acts Passed by Government, Defence News, About important Persons, Places, Banking & Economical News, Awards & Honours, Sports News, Revolutionary Updates on Arts & Culture, Obituary, Summits & Conference, Important Committee, Schemes, Appointments, Important Days & its Theme for Current as well as upcoming Year, Books & Its Authors, Agreements & MoUs, Budget, Taxes, Various Important Lists & Indexes, Visits by World Presidents, Prime Ministers, Political affairs and all Current Events. 9th February 2019 Current Affairs Quiz Questions updated in this page are prepared in the sense to help all aspirants to succeed in various Competitive Exams like UPSC IAS and other Civil Services Examination, Various Bank exams like IBPS PO, IBPS Clerk, SBI PO, SBI Clerk, RRB PO, RRB Assistant, Insurance exams like LIC AAO, UIIC Assistant, Railway Exams, Various Central Government Exams like SSC CGL, SSC CHSL, and more. Attempt all the Current Affairs Quiz Questions of 9th February 2019 and evaluate your score by matching your response with the correct answers mentioned at the end of this quiz questions section. By practising the FreshersLive Current Affairs Quiz Questions on a daily basis, you can surely succeed in the competitive exams as well as the interviews easily. Make use of this ultimate resource to the fullest and quickly achieve your goal!